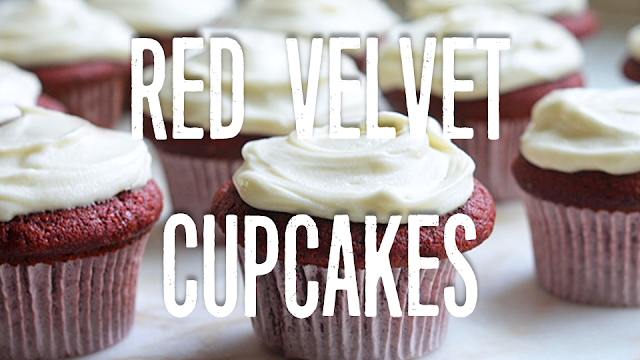 Red velvet cupcakes, cakes, cheesecake are always impossible to get right. Without cheating and buying ready mix red velvet mixture this recipe makes the most perfect red velvet cupcakes with cream cheese frosting (if you have patience)! They are simple to prepare, in just one bowl, and make perfect, fluffy, moist cupcakes with that deep red hue. So since Valentine's Day is just around the corner, I thought these would be just perfect for the occasion. Preheat oven to 180°C. Line a cupcake pan with baking cups. In a small bowl, whisk together flour, cocoa powder, bicarbonate of soda and salt; set aside. With an electric mixer, beat together the oil, sugar and buttermilk on medium-high speed for about 2 minutes until pale and fluffy. Add the eggs, food colouring, vinegar, vanilla and water and mix well. Slowly add the flour mixture, on low speed. Mix until just combined; do not over mix or the cakes will come out tough. Divide the batter between the paper baking cases and bake for 20 minutes or until a cocktail stick inserted into the centre of a cake comes out clean. Allow to cool on a wire rack. Transfer to a wire rack to cool completely before frosting. Whip the butter and cream cheese together in a mixer until creamed. Gradually add the icing sugar to the mixture, scraping down the bowl as needed. Add the vanilla and mix until combined. Pipe or spread on top of cooled cupcakes.